Companies that sell the Canon CLI-8 cartridge are shown on this page. Use the description, prices as well as the company reviews and coupons to comparison shop for the best deal. For more product information or to purchase the cartridge, click the links below. 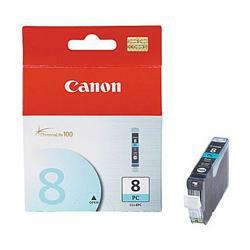 This Brand New Canon CLI8C cyan ink cartridge is manufactured by Original Equipment Manufacturer (OEM). 100% Manufacturer Guaranteed. Buy 4 for FREE US SHIPPING! This Brand New Canon CLI8BK black ink cartridge is manufactured by Original Equipment Manufacturer (OEM). 100% Manufacturer Guaranteed. Buy 4 for FREE US SHIPPING! This Brand New Canon CLI8M magenta ink cartridge is manufactured by Original Equipment Manufacturer (OEM). 100% Manufacturer Guaranteed. Buy 4 for FREE US SHIPPING! This Brand New Canon CLI8Y yellow ink cartridge is manufactured by Original Equipment Manufacturer (OEM). 100% Manufacturer Guaranteed. Buy 4 for FREE US SHIPPING! This multi-pack contains 1 black, 1 cyan, 1 magenta, and 1 yellow original CLI 8 cartridges. Comes with full manufacturer's warranty. OEM CLI8 pack: 2 Black, 2 Cyan, 2 Magenta, 2 Yellow. Brand new OEM cartridges with manufacturer warranty. Save your money with the Canon CLI-8Y, CLI8Y Yellow Compatible Inkjet Cartridge. Save your money with the Canon CLI-8BK, CLI8Bk Black Compatible Inkjet Cartridge. Save your money with the Canon CLI-8PM, CLI8PM Photo Magenta Compatible Inkjet Cartridge. Save your money with the Canon CLI-8M, CLI8M Magenta Compatible Inkjet Cartridge. Save your money with the Canon CLI-8PC, CLI8PC Photo Cyan Compatible Inkjet Cartridge. Save your money with the Canon CLI-8C, CLI8C Cyan Compatible Inkjet Cartridge. Save your money with the Inktec CLI-8BK, CLI8 Black Ink Refill Kit for Canon. For use in the Canon Pixma iP5200R inkjet printers. Save your money with the Inktec CLI-8C, CLI8 Black Ink Refill Kit for Canon. For use in the Canon Pixma iP5200R inkjet printers.